Blockchain will have a massive impact on banking, digital identity, smart contracts, digital voting, and decentralized notary. So what does this mean for designers? As I’ve learned about blockchain, I’ve started to see where it connects to user experience design. Translating some of the technology components into what we, as UX designers, are used to working with has helped me understand how we can contribute to a blockchain-based project—something we’ll likely need to know how to do in the not-so-distant future. For the purpose of this article, I’ll be referencing Hyperledger, a cross-industry collaborative effort from the Linux Foundation to support blockchain-based distributed ledgers. “A blockchain can serve as an open, distributed ledger that can record transactions between 2 parties efficiently and in a verifiable and permanent way. For use as a distributed ledger, a blockchain is typically managed by a peer-to-peer network collectively adhering to a protocol for validating new blocks. Why should designers care about blockchain? Blockchain will have a massive impact on banking, digital identity, smart contracts, digital voting, decentralized notary, and many more. New applications made to disrupt entire industries are being developed as we speak—they’ll offer an upgrade in both technology and user experience. Democracy.earth: A borderless peer-to-peer democracy. 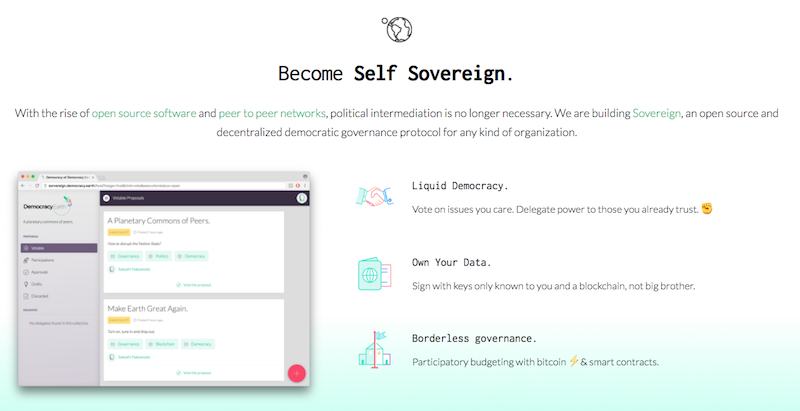 They’re building Sovereign, an open source and decentralized democratic governance protocol for any kind of organization. Everledger: A global, digital ledger that tracks and protects valuable assets throughout their lifetime journey. They collect an asset’s defining characteristics, history, and ownership to create a permanent record on the blockchain. Is there a change in the experience? With these applications, there are cases where the technology is completely transparent for the end-user. For example, a blockchain built on top of existing digital services will add the element of trust to the whole process by enabling an audit trail, but the user experience could very well stay the same. The question is, can we transmit this added element of transparency to the users? Imagine government services, transactions of high-value assets, and our own digital identities. Wouldn’t we choose a product that’s offering added trust to handle our assets over any other? Wouldn’t we get on board with the idea of digital identities if it’s a better experience than our current identification standard? Wouldn’t we want more transparency in our government? The answers to those questions present an opportunity to engage users in a positive experience by highlighting the touchpoints where the backend is making their lives better. And in order to do that, designers must first understand what’s going on behind the scenes. It helps to speak the same language if we want to join the conversation with developers. What follows are the concepts I’ve been exposed to during our product development sessions and how I connect them to our own UX design workflow. Different user roles that interact with the blockchain. Based on user profile, the developer models the “participant” within a network. This involves the input, logic, and output of a transaction. Similar to a single task-flow analysis performed by a specific user role. Comprised of participants, it’s a space to interact with assets via transactions. Sub-networks to allow private interactions between participants. This is the behavior users agree to follow in a blockchain. What are the incentives to be part of a network? Understand the value of joining a network. Hyperledger is permission based. You need to request/grant access to a participant to allow them to interact within the network. If you start a network, why would someone join? What are the user stories? 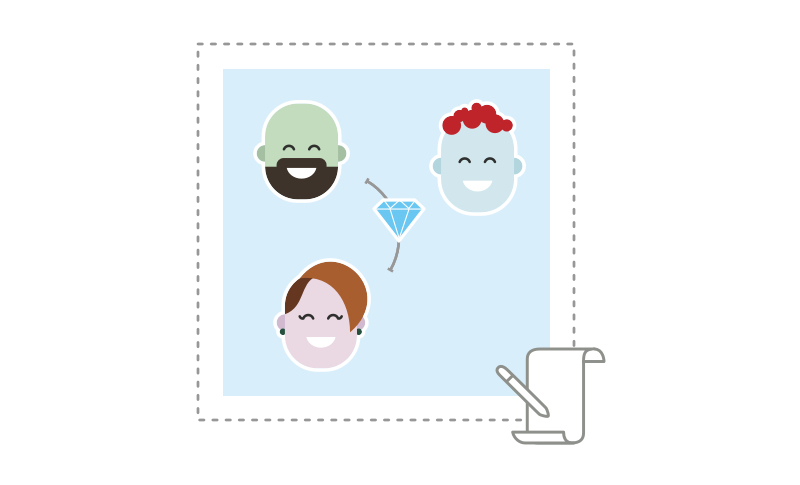 User stories help developers think about the user—beyond technical specs. A successful blockchain application returns a validated chaincode. A successful UX in a blockchain application makes it seamless for someone to start using the application regardless of the technology behind it. That’s why UX designers need to understand who’s involved, how it works, and how to design the experience of a highly disruptive technology, in order to create an experience that is 10 times better than the one provided by the technology being disrupted. As new technologies mature, UX designers can either limit themselves to just be users, or they can sit in the room with developers and figure out how to contribute to the future. By getting involved in the learning curve that developers are immersed in right now, UX designers can help advance the next generation of digital services. Are you working on a blockchain-based project that you’d like to share on the InVision Blog? Get in touch. Vanessa Colina is a user experience designer in Washington, DC. She specializes in user research for mobile applications using emerging technologies.